Artichokes were on sale the other day at the grocery store (four for five dollars!) and I wanted to experiment. I hadn’t had whole artichokes in such a long time and honestly had never cooked them myself. To be completely honest with you, these things really aren’t that scary at all. Don’t be intimidated my friends, there’s just just one good whack with a knife to trim the top off and then some boiling action in a large pot. Tada: Artichokes for dinner! I served mine with some whole wheat spaghetti tossed in fresh pesto. How do you eat them? Simple! Rip off the leaves and drag your teeth along the inside edge, scraping away the soft flesh. As you get closer to the center, you can actually eat the leaves entirely. Whatever you do, do NOT discard the center of the artichoke! Seriously, the center is the grand prize – its the heart and is fabulously delicious! I got this recipe from Cooking Light…shocking, I know. I’ve got some new stuff coming for you soon! I’m finally finding some time to spend in the kitchen again and have been up to some yummy stuff (spoiler alert: I’ve got THE BEST carrot cake coming your way). 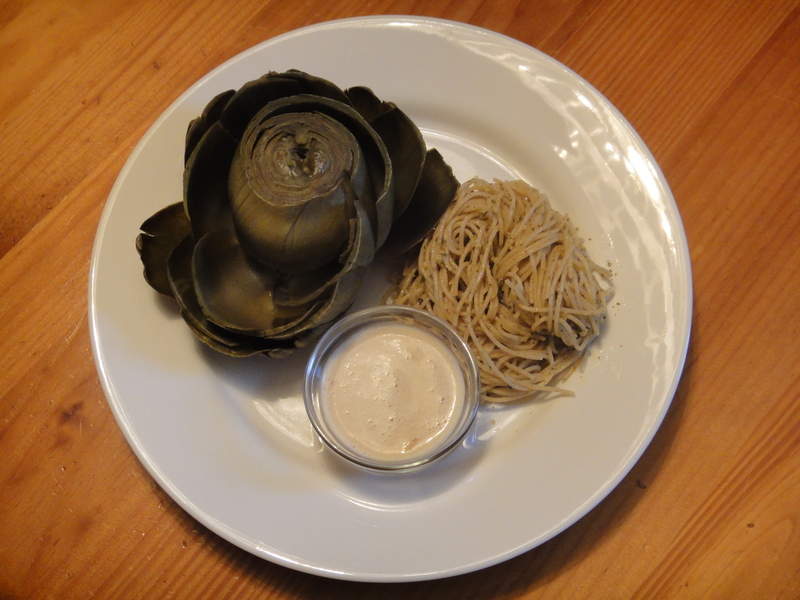 I love artichokes, but don’t cook them as often as I should. Can’t wait to try this recipe out! I hope artichokes go on sale here soon. I really want them now! Artichokes are my favorites! Delicious Recipe!